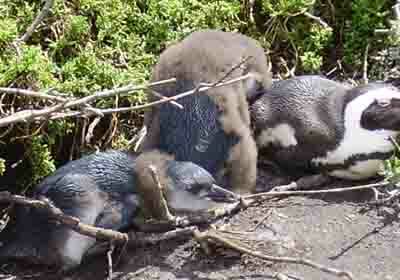 Stony Point near Bettys Bay on the southern coastline of the Western Cape has become home to a penguin colony. Penguins normally live and breed on islands around the South African coastline and do not normally live on the mainland. In the Western Cape however we have two colonies of penguins that have decided that the mainland is a good place to stay and have come ashore and started building nests and breeding. In 1982 the first penguin nests at Stony Point were discovered and now there are more than 80 nests to be found in the area. To protect the penguins from the surrounding elements their breeding area has been fenced off and this keeps out dogs and people who would disturb the penguins during their breeding cycle. African penguins' numbers have decreased by 13% since 1976 and the penguins are now on the vulnerable list in the Red Data book hence the protection being afforded to them. The causes for the fall in numbers is the lack of food caused by over fishing, oil pollution and disturbances in the breeding colonies. There are 18 different species of penguin worldwide but the only one found on the African continent is the African penguin or Jackass penguin as it is known elsewhere in the world. The reason it is called a Jackass Penguin is that it makes a braying sound when communicating with other penguins. Penguins when breeding form lifelong pairs and commence breeding between the ages of two to four years. When they start breeding they either dig a deep burrow into the ground or just scrape a nest out of the soil and then lay two white eggs in the nest. The incubation period takes between 38 and 41 days. Once the chicks have hatched they are fed by both parents and will consume about 25 kilograms of fish by the time they are fully fledged. It takes about 11 weeks for a chick to be fully fledged. Each year for a period of about 21 days penguins moult and while they are losing their feathers they have no option but to sit on the beach and starve. They look quite pathetic just sitting there looking all bedraggled with half of their feathers missing. The reason they cannot eat is that while moulting they lose the natural oiliness in their feathers which protects them from the cold. Without this protection they would die. Once the penguins have got their new feathers they go back to sea to hunt for food. Their swimming range is approximately 20 kilometres per day and can go as high as 40 kilometres if food is not found. When out hunting they catch anchovies sardines and pilchards and consume up to half a kilogram of fish per day. While at sea penguins are at risk from a number of natural predators such as sharks and seals. Another very real threat is oil pollution which happens quite often along the South African coastline. When a penguin becomes oiled it cannot hunt and if not caught and cleaned it will die. Over the years many penguins have been killed by oil pollution but these days penguin colonies are monitored and if oil soaked penguins are found they are caught and sent to SANCCOB where they are cleaned and fed until their natural oiliness returns and theycan once again be released into the wild. Penguins are like homing pigeons and if you catch one you can release it anywhere along the coastline and it will soon find its way back to its breeding colony. On land penguins also have a number of enemies which include leopards, caraculs, kelp gulls and mongooses. These animals attack the nests, steal the eggs and chicks and cause havoc in a breeding colony. In the Western Cape nature conservation has taken over the protection of the land based penguin colonies and have provided board walks where visitors can get close to the penguins without actually disturbing them. The penguins in the Simonstown colony have become a major tourist attraction and visitors are able to get pretty close to the penguins without bothering them. 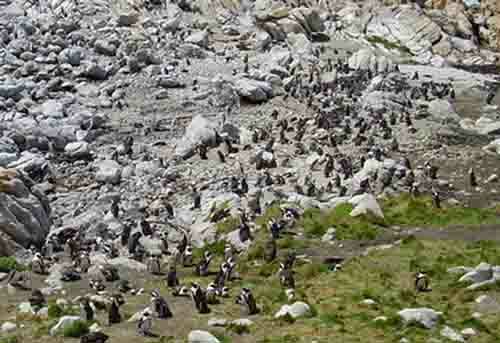 Although the colony at Betty's Bay is not as well known as the Boulders colony it is in my estimation better for viewing the penguins than the Boulders site. When you next visit Cape Town take time out to visit at least one of the penguin colonies.